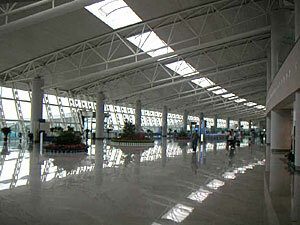 The Qingdao International Airport is 36km away from city center. Fourteen international and regional routes and 130 flights each week link Qingdao with the rest of the world. There are 442 direct flights to many cities in Asia - among them Tokyo, Osaka, Fukuoka, Seoul, Pusan, Taegu, Singapore, Bangkok and Hong Kong - and flights to Europe, USA and other destinations. Around 750 flights are in operation each week linking 47 domestic cities, including Beijing, Shanghai and Guangzhou. Qingdao Railway Station connect Qingdao with Lanzhou, Chengdu, Xi´an, Zhengzhou, Jinan and Jining. The Orient Ferry connect Qingdao with Shimonoseki, Japan, and there are numerous smaller ferried connecting Qingdao with Korea.